A good point of reference is the small village Sogndal on the north side of the Sognefjord. From here, drive 28 km along Hwy. 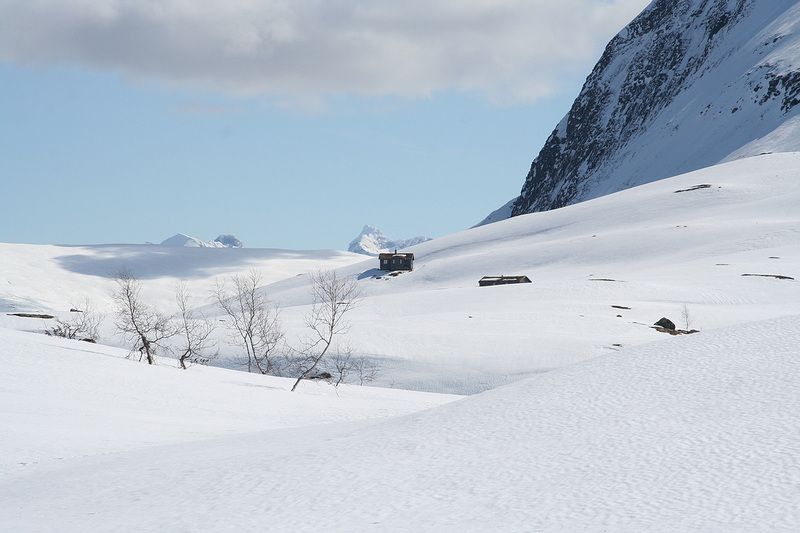 55 to the village Gaupne, make a left turn and continue approximately 18 km up the Jostedalen valley. Just before a tunnel, a road forks right to Vigdal. This road crosses the river, then climbs steeply with several hairpin curves including a small, but interesting tunnel. This narrow road will lead you to a small parking area just beyond the last farm. 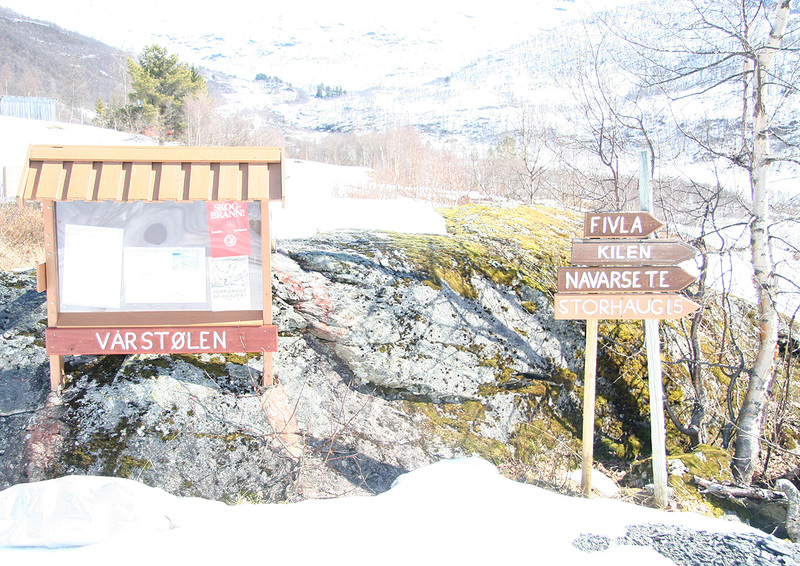 From here, a short toll road can be followed to Vårstølen, this road is closed in winter and spring. Thus, the all year trailhead is located just after the last farm at location N61:30.775, E007:18.936, elevation about 555 meter. Take the road onwards to Vårstølen, this is just a few gentle uphill sections of the (paved) road. Shortly after the road levels out you will notice a sign on your right hand side. 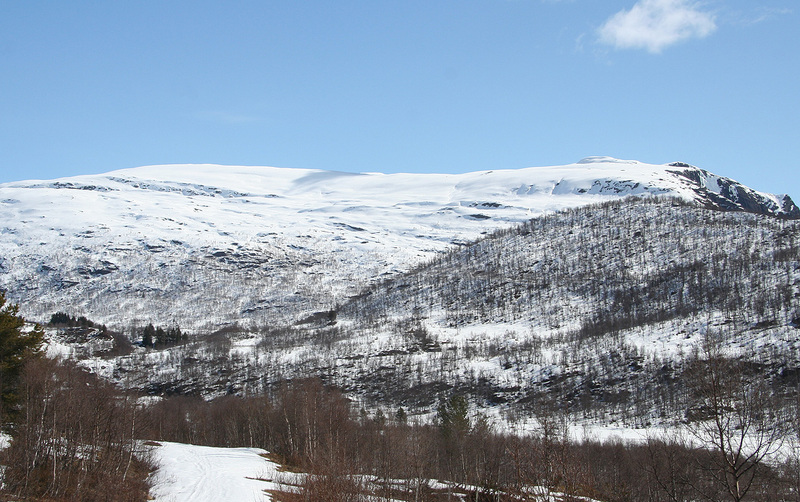 The road continues and the mountain ahead is Kattøyro (1411m), with the hill Storhaug (868m) in front on the right hand side (across the river). Do not continue, but leave the road by the sign and follow the trail downhill to the small river that can be crossed on a well made wooden bridge. The next challenge is to climb the somewhat steep hillside above. 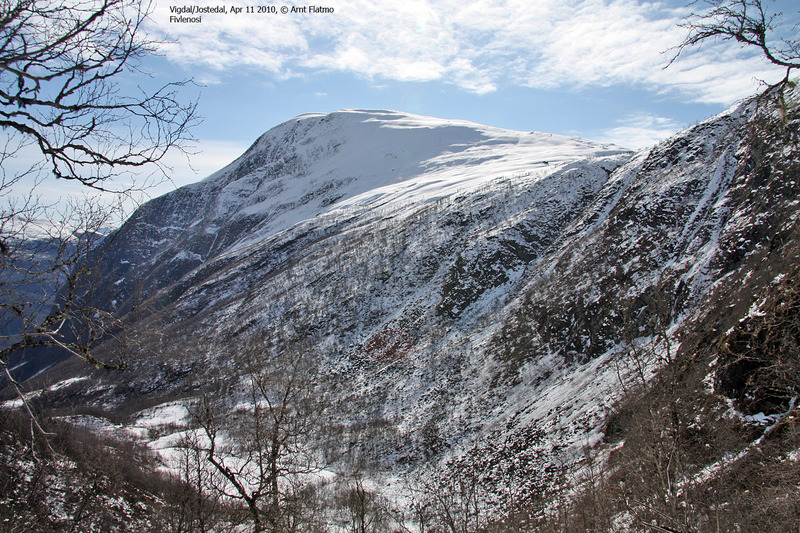 In winter/spring, it can be hard to locate the best route if there are no tracks. Turn left and cross some meadows, then start a very gentle ascent going left (when facing the hill). Do not ascend too rapidly, you will then find a fairly smooth slope leading to the 740 meter saddle south-west of Storhaug (868m). From here, ascend the ridge towards point 935. With skis, I found it best to stay on the west (right) side of the ridge and follow a pretty natural path well below the upper part of the ridge, then gradually turning left (south) and gain the flat area just west of the cabin Fivla. From the Fivla area, one can ski pretty much directly towards the summit using the natural variations in steepness to own advantage, perhaps moving a bit more right before the final summit push. I climbed this peak after a very early morning climb of Grovabreen, it seemed a shame to end the day several hours before noon. 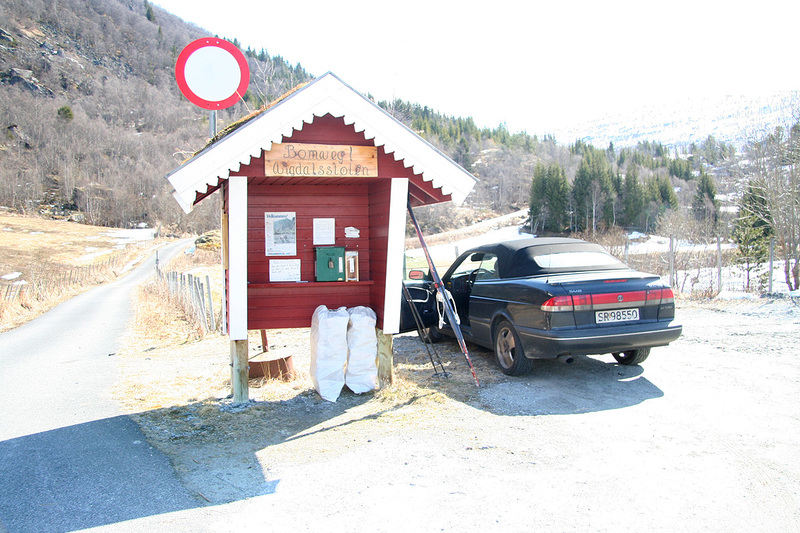 Thus, I drove across to Sogndal and further to Gaupne before finding the small, but steep road leading up to Vigdal. This road is narrow and I found it quite entertaining. Perhaps most interesting is the tunnel, narrow and with several curves and charming small lamps hanging from the ceiling. I started out by 1130, still not noon and it felt like I had already been out quite a while. After crossing the bridge, I made a stupid mistake of climbing the hillside instead of traversing to the small col. I had no idea about doing two mountains, therefore my map was left behind back in Bergen. The next 30 minutes was not at all pleasant. Small cliffs, then enormous boulders. Add in the general steepness and too many trees - the mountain itself seemed like abstract theory. I gained the ridge and progress immediately improved, I quickly decided that I would follow this ridge further down on my return trip. The trees grew thinner and I emerged quite a bit west of the Fivla cabin. No problem, my goal was Fivlenosi not a mountain hut. Unfortunately, skiing was not anywhere as nice as on Grovabreen. No new snow and a rather icy crust that required constant use of the steel edge rather than the ski itself. I kept gaining elevation, but started to feel the morning trip possibly combined with lack of food (I had no breakfast at Skei before 0500). Somehow, I had the idea that this peak exceeded 1500 meter, as I took a break and checked my elevation, the GPS read "only" 1350 meter. Quite a disapointment, almost 200 more vertical meter to gain. My happiness (and surprise) was quickly regained when the peak turned out to be almost 100 meter lower. I arrived at 1420, less than 3 hours despite the fight in the first hill. I took pictures and had a good look around. Hurrungane were noticeably closer here than when seen from Grovabreen. After 10-15 minutes, it was time to return. The skiing back down was uneventful and I returned to my car by 1545. I had a nice drive back home to Bergen after a pretty long day, "a doubleheader" is what this is called in sports. I had more than 2000 vertical meter of ascent and felt I deserved a shower and some dinner upon my return. Fivlenosi, as seen from the vicinity of the col connecting Storhaug with the ridge towards Fivla (Photo Arnt Flatmo). Hurrungane, as seen from Fivlenosi. 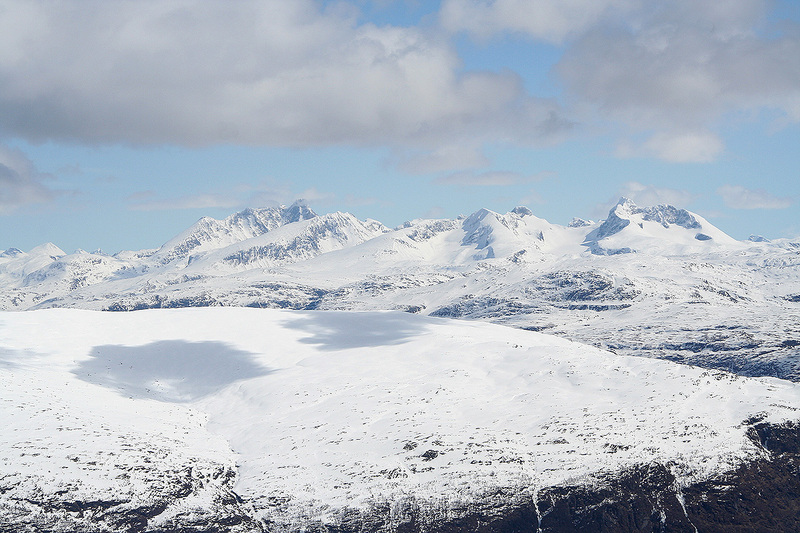 View across Jostedalen, from the trailhead in Vigdal.